I loved Sherman as much as anyone can love a dog. 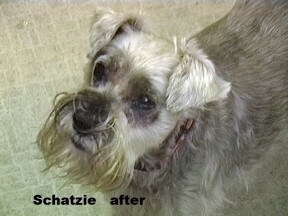 Shatzie was our second rescue and was a perfectly healthy little Schnauzer. A treatment for itchy skin left him with diabetes. That meant that I would check his insulin twice a day. I became quite good sticking a small cup under him to catch his urine when he would lift a leg. Little by little, as I devoted more time to him, he became my favorite. We had learned to drive and use our RV by visiting family and friends before we crossed over the border to begin our trip around the world. On the way to visit someone in Houston, Texas, we stopped in San Antonio. 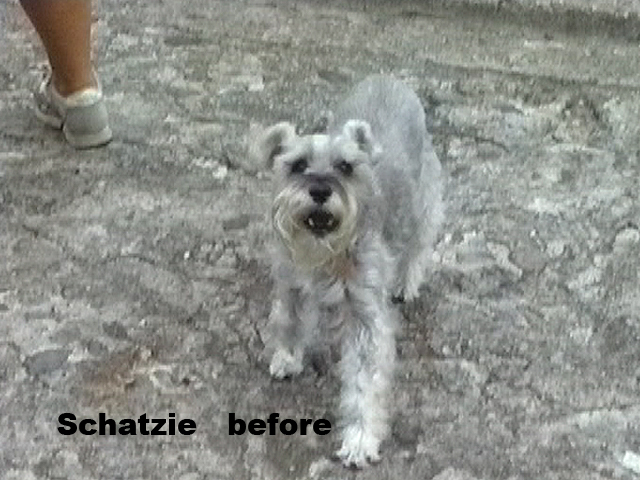 A walkway next to a river became the first danger to Shatzie. I had him and Sherman on a leash, but he fell in anyway. Quickly I pulled him out, dried him off, and resolved to be more careful. I hadn’t thought to check his eyes, I just thought he was getting old. The next day, I stopped in a pet store and purchased a harness for him. With the harness, I could pull him up at a second’s notice. I think the extra straps around his midsection gave him a feeling of safety. We crossed into Mexico from Texas and drove the Devil’s Highway down to the Pacific Coast. His eyes were getting more and more covered by white until he looked like a comic book character. It was becoming harder and harder to walk him, especially along Mexican sidewalks that can disappear suddenly, or drop down a foot without any warning. Wires stuck out from buildings about four inches above the cement and other obstacles could occur at any moment. Intersections weren’t any safer. Trucks would blast horns at pedestrians for fun, and Shatzie would freeze. I would pick him up and carry him cradled in my arms, past any problem areas. By now, I knew he was blind. I tied bells on the laces of my shoes, and Shatzie learned to follow them. That meant that he no longer walked in front of me, but in the back. Once, as I passed a restaurant, several women exited the restaurant and one stepped on his foot. He let out a scream, and I instantly turned and picked him up. Without thinking, I yelled “He’s Blind!” The poor woman looked like I had poured cold water over her, and she began to cry. Knowing that it wasn’t her fault, I then began to comfort her as well as Shatzie. As we traveled up in the mountains or back to the beach, we found that we had to adjust the amount of insulin each with move until his sugar levels evened out. Traveling in an RV in Mexico means that every few hundred miles you will come to a military stop. Young men with very big guns would stop us and want to see in the RV. We think that looking is the only reason they stopped us. They would always enjoy seeing the little bathroom and kitchen. Usually, as they entered the RV and saw the dogs, they would stop, not knowing what the dogs would do. I would say, “No problema. es ciego.” (He’s blind and not a problem.) They would look incredulously at me, then at Shatzie, and he would stare back with his white eyes. Finally, while we were camping in Tepotzotlan, about an hour from Mexico City, the local vet told us there was a doctor in the city who could remove the cataracts and give him sight again. Both Ted and I wanted to do that, and the vet called Mexico City and made the appointment. 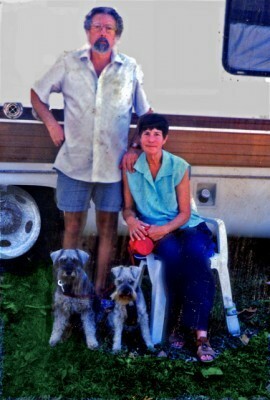 The next morning, our vet pulled into Pablo’s RV park and picked up Ted and Shatzie. I stayed home with Sherman, worrying all day long until, about 8 p.m., the vet pulled up next to us and Ted got out, holding Shatzie. Schnauzer’s have bushy eyebrows over their eyes as well as a moustache, but the vet had to shave all the fur around his eyes, and he looked a bit funny. He was tired, probably from the drugs used during the operation, and we put him to bed, glad that he had made it through the ordeal. Early the next morning, he woke and moved to the water bowl. I watched as he stood very still, head tilted, and looked around the room very slowly, as though seeing it for the first time. Sherman came out and sniffed Shatzie all over. When the greetings had been made, I fastened their leashes on. As I stepped down the three little steps to the ground, Shatzie stopped at each one, turned and examined the step. Finally we made it to the ground, and we began to walk. Shatzie stood and examined the sidewalk and then moved to the right to examine a tree. Suddenly the wind blew a leaf in front of him, and he jerked back. The leaf landed by my feet, and he slowly approached me and sniffed the leaf. As we continued around, very slowly, he looked at each and every thing we came across, the sidewalk, tree wells, leaves, dirt, pebbles, steps down and steps up. The world was new to him, and he was going to enjoy every inch. Ted and I were both crying. When he had been blind, if Sherman would bark, Shatzie would rush to be by Sherman’s side, barking all the time. It was as if he was saying, “I don’t know what the danger is, but I’ve got your back.” Now, when Sherman would pause, Shatzie would move to him, looking all around for the danger. After a few days, with his sight restored, he was ready to move on with us, to see what was down the road. Shatzie got to see the ancient ruins, new RV parks, and run on beaches. He saw Venezuela, Honduras, Nicaragua, and Costa Rica. He was almost seventeen when he developed cancer, and we let him go. We missed him but knew that we had given him a very good life. He had six years with diabetes, and we have been told, that’s a very long time. M I remember Shatzie so well but did not remember the diabetes and blindness. Reading your poignant story almost had me in tears and I agree that you and Ted gave him a very good life. He’s smiling and barking at you, lovingly, from doggie heaven! What a lovely story! I’m so glad he got his sight back. Very touching story. You certainly gave Shatzie a great life. It’s so hard to give up our four-legged kids. He’s going to be waiting at the end of the Rainbow Bridge for you. Loved your story. I nursed our Bischon Frise back on all four paws after he went lame after jumping off the bed. It was a bonding time and I was happy I had just retired and could take time to carry him up and down stairs, hold his hind legs with a towel, and coach him back to walking. He eventually ran on all fours. I was devastated when the cancer I’d kept at bay for four years (another story) came back with a vengeance and I had to let him go. He was a wonderful dog. 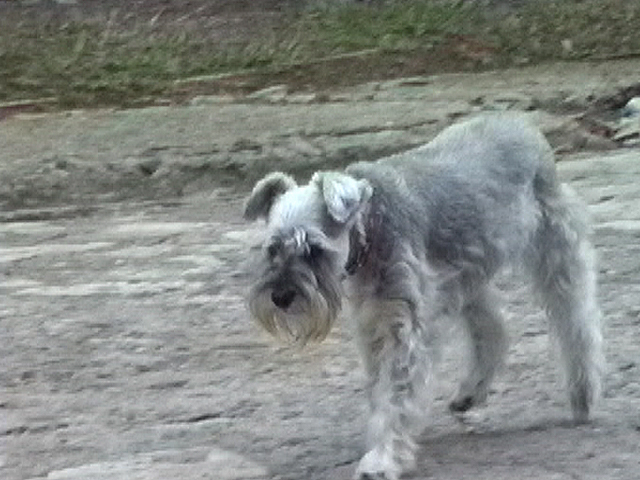 My first schnauzer Noel (born on Christmas day) was a gift from my kids. What a gift. She was my heart. Later she developed a heart murmur and diabetes. I gave her 4 medications every single day and she was a trooper about it. She lived to be 12 and up until that final 2 days, she was always filled with joy and happiness to be alive. My vet said that normally she shouldn’t have survived more than 6 years.